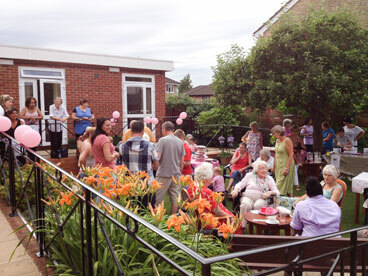 For three decades our family-owned residential care home has provided high quality care for those aged 65 or over. At Oakhaven, exceptional care comes as standard. 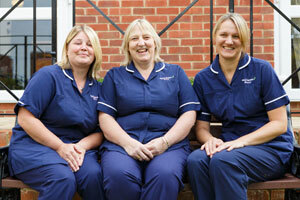 Our team of experienced staff is dedicated to the all-round well-being of every resident, whatever their needs. 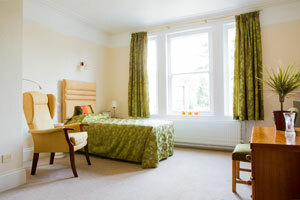 With 27 fully-equipped bedrooms, mostly en-suite, all furnished to an exceptionally high standard, and qualified professional staff always on hand, Oakhaven is the perfect choice for those seeking the very best care in Cheltenham. Welcome to Oakhaven. 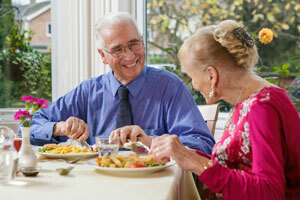 A place for you or your loved one to live life the way you wish. Set in the leafy heart of Cheltenham, Oakhaven has been in my family for over 30 years and throughout that time it has been my aim to ensure that everyone who moves here is given first-rate care in a first-class environment. It is our attention to detail that I believe makes us the best care home in the area and that is certainly what friends, relatives and professionals tell us. At Oakhaven you will find an experienced, loyal team dedicated to going that extra mile for you. However Oakhaven is about much more than just care - it’s about happiness and fun and doing the things that make life pleasurable. 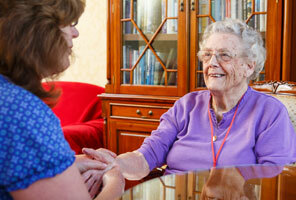 With us you will find someone with time to sit down for a cup of tea and a chat. 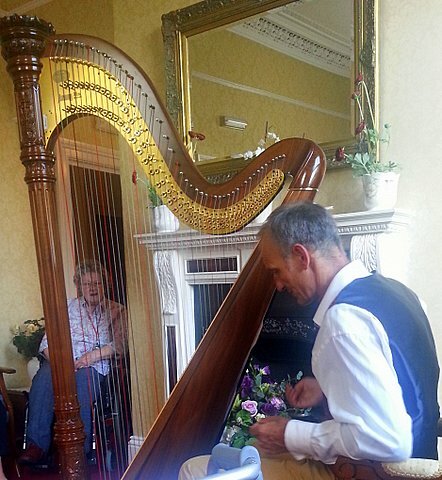 Fresh flowers and line-dried laundry, lunch on the terrace and open windows, people singing in the corridor and quiet places to read … these are some of the things that make Oakhaven a home and I heartily invite you to come along and experience this for yourself. 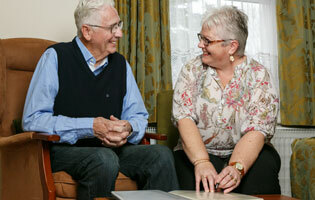 Respite, convalescence or a longer term stay, whatever you need, Oakhaven has something to suit you. With our many years of caring experience we can help you make a decision that best suits you, and we will support you all the way through. Our fees start at £794 per week and include all the essentials: 24 hour care, accommodation, laundry, food and our extensive range of activities and entertainment options. When you first come to Oakhaven we sit down with you, your family, your GP and any other medical professionals to create an individual care plan for you. This will be regularly reviewed and updated to ensure the care you receive is tailored to your specific needs and fits around your lifestyle and aspirations. Before you make your decision we invite you to spend time with us to meet everyone and begin to feel at home. Our aim is to make this time as uncomplicated and pleasurable as possible for you and your family. To discuss living or staying at Oakhaven just call us on 01242 528377 and we will be happy to provide all the help and information you need. 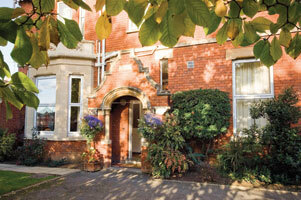 We believe it is our people who make Oakhaven the best care home in Cheltenham. 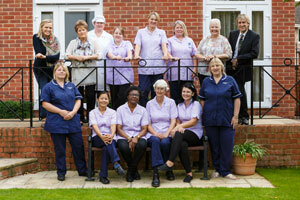 The Oakhaven team is devoted to providing optimum care for all. We only employ the very best people and we continually invest in on-going training. But we know that kind hearts and friendly faces are as important as formal qualifications. Our team has both: their empathy and compassion complements their professionalism, helping a close bond to develop with both the resident and their family. It is one of the most reassuring aspects of Oakhaven and what makes it such a lovely place to live. Where extra care is required, it is given discretely, with dignity and respect - your comfort and personal needs are at the forefront of everything that we do. 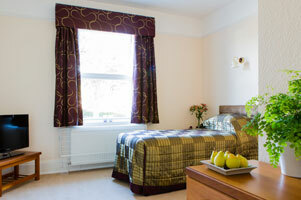 With 27 rooms, most en suite, Oakhaven is fully equipped to accommodate all your care needs. Each room is fully-furnished to an extremely high standard and we can help arrange your own personal belongings if you so wish. Oakhaven is a beautiful, red-brick building complete with high ceilings, stained glass and original fireplaces. Stepping through the front door you will find a spacious hallway leading through to the sitting rooms and dining room. The two adjoining sitting rooms offer the choice of somewhere to relax with a book for a peaceful read or somewhere to chat and share the news. In winter you will find us snugly cosseted from chills and bad weather, and in summer the sash windows give natural light and a cooling breeze. From the hall, a wide staircase leads to the upstairs bedrooms, and there is also a lift for ease and convenience. Our rooms are spread over two floors and are furnished to an exceptionally high standard. All are ready for those personal things – furniture, photos, pictures - everything you would like to make it your own. Naturally, phone sockets and flat screen TVs are provided for you and we also have WiFi if you wish to bring a computer, smartphone or tablet. Our team of chefs are passionate about providing the very best food - not just for good health but as one of the pleasures of the day. At Oakhaven you can enjoy good, fresh and nutritious food every day - and leave the cooking and cleaning up to someone else! Residents with smaller appetites or recuperating from illness have told us how the meals at Oakhaven have made a real difference to their health - and many have rediscovered their enjoyment of food whilst here. You will find your ideas for menus are always welcome. Our chefs love to try new recipes, and our residents enjoy remembering the taste of foods they may have forgotten over the years. Menus are changed throughout the year to make the most of each season’s produce, and our chefs source as much as possible locally. Your family and friends are always welcome to join us, whether popping in for tea and cakes on the lawn, sitting down with you for one of our delicious Sunday roasts or celebrating your birthday. At Oakhaven nothing is forgotten, from sherry before lunch to home-baked cakes with your tea or coffee, everything is taken care of allowing you to relax and enjoy your food. At Oakhaven we believe in bringing fun and laughter into the home every day. Making friends, finding new interests or just getting out and about, there is always something for you to do. Together we plan activities and outings to suit everyone, and as variety is the spice of life we love to do lots of different things to make the most of every day. You will find a list of upcoming events on the notice board and in our newsletter. Music and singing are a big part of life at Oakhaven. We bring the theatre here with shows full of favourite songs and dances, from Broadway and big band classics to the popular music of yesteryear. It’s good old-fashioned entertainment to put a smile on your face! We offer weekly classes designed to bring health, fitness and fun to all. 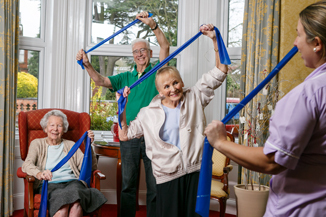 From armchair aerobics to ball games and croquet taking regular exercise is well known to lift the spirits and improve overall wellbeing. 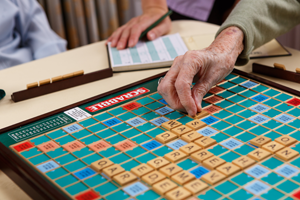 If you enjoy word games and quizzes there is plenty of opportunity to pit your wits against like-minded friends. We also have a wide selection of board games to choose from. Time spent just talking and sharing memories can be very positive and meaningful. A heart-warming stroll down memory lane can be a therapeutic exercise as well as a lovely way to pass an hour or so. .
Reminiscence activities, such as looking at photographs or talking about music, are known to give warm feelings of value, worth and belonging, so at Oakhaven you will find a friend to listen and talk about your life’s story. 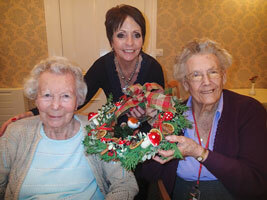 At Oakhaven we make sure there is always plenty of time for hobbies. You could take up something new like jewellery or card making or rediscover an old talent such as painting with water colours or flower arranging. If you want to try something new we will be happy to try and arrange it. There is plenty of fun to be had from our outings, not just the trip itself but the planning and anticipation beforehand. Ideas are always welcome for new things to try and everyone can join in as much or as little as they like. Seaside trips and days out to the theatre are ever-popular but if you feel like a little stroll to the corner shop we can help with that too. 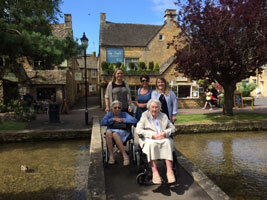 As we are in the beautiful Cotswolds we often take drives out in the countryside, calling in at villages like Broadway or Stow-on-the-Wold to make the most of the lovely places on our doorstep. Oakhaven takes a holistic approach to well-being, so as well as our everyday activities we provide many other types of support. For example we have our own visiting chiropodist and hairdresser, then there is the Oakhaven shop for toiletries and confectionary, a newspaper and magazine delivery service, pet therapy, onsite laundry, or we can even arrange to have your dry cleaning collected and delivered. We will arrange transport to hospital appointments if you wish, and for spiritual comfort we have appropriate religious services and pastoral visits.